The EPL-PM-150LED-480V-100 Explosion Proof LED Light from Larson Electronics is rated Class I Divisions 1-2 Groups C & D and Class II Divisions 1-2 and uses a 16 inch Cree LED light head to produce 17,500 lumens of light while drawing only 150 watts. 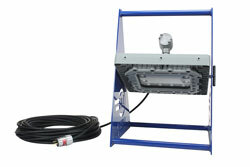 This explosion proof light is equipped with an explosion proof 2-pin 3-wire 480V pin/sleeve cord cap. The EPL-PM-150LED-480V-100 explosion proof LED light provides 9,000 square feet of work area coverage with 17,500 lumens of light output. This portable LED light is mounted to an A-frame style aluminum base and has an adjustable LED light head measuring 16 inches wide by 14 inches high. The LED light head on this unit produces a brilliant flood pattern of light that is ideal for illuminating enclosed areas and hazardous locations where flammable vapors, gases and dusts may be present. This explosion proof LED light fixture is comprised of a 16 inch wide square LED light head mounted within a portable base stand fabricated from non sparking aluminum with a convenient carrying handle built into the top of the stand. The aluminum A-frame is powder coated with glossy blue finish for corrosion resistances and aesthetics. The lamp can be easily adjusted up or down 90 degrees and locked into position by simply loosening the two hand screws located on either side of the light head and retightening them once the desired angle is found. LED Drivers: Even in LED fixtures, heat is the single largest factor in premature light failure and color shifting. As a result, many manufacturers reduce the output of their LEDs in order to reduce the amount of heat produced. Rather than lower light output or quality, Larson Electronics addresses this problem with the addition of electronic LED drivers. These internal drivers provide the ability to automatically monitor and adjust input current to maintain the correct LED voltage levels regardless of input levels across a specific range. This not only reduces the energy dissipation, effectively lowering the operating temperature of the fixture, but also prevents AC over-voltage and short circuit loading making this fixture virtually maintenance free. 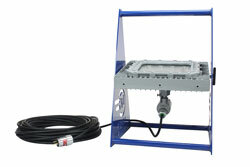 Because the electronic drivers allow the EPL-PM-150LED-480V-100 to run at a cooler internal temperature and regulates the electrical current, energy efficiency and LED service hours are maximized while at the same time reducing operating costs and downtime incurred from the frequent servicing intervals required with other hotter running lights. The explosion proof LED light fixture features multiple LED drivers which helps to increase the operational life of the fixture. 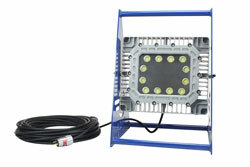 With traditional LED lights, in the event an LED array or driver fails, the entire fixture no longer illuminates. With the EPL-PM-150LED-480V-100 series of explosion proof lamps from Larson Electronics, each LED fixture contains six individual LED boards configured in a series of banks. Each bank contains two LED on a single board with an individual driver. In the event of a driver failure, only one bank of LEDs will be effected while the other banks will continue to operate. In the event that of an LED failure, the mating LED will continue to operate.